Members of The Melton Musical Theatre Company were sighted sweating through the town’s country park dressed as nuns on Saturday. The group organised their own five kilometre nun fun run to raise funds and awareness for their up and coming production Sister Act, at Melton Theatre, in October. Around 20 friends took part in a route that saw competitors jog or walk the distance. 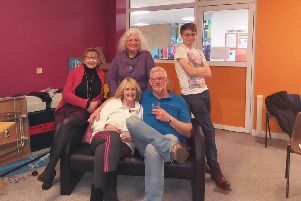 Melton Musical Theatre Company’s business manager, Andy Brown, said: “The idea came out of our AGM earlier this year when we were discussing creative fundraising ideas, and ways to get our nuns out and about to promote the show. “It was all a bit of fun but if there was a clear winner it was probably Peter Etherington for the men and Judy Marshall for the ladies. Somehow our president Graham took a wrong turning and ended up finishing later than everyone else. Sister Act is a musical comedy with original music from Oscar and Tony Award winning Alan Menken (Little Shop of Horrors, Beauty and the Beast). It follows the story of Deloris Van Cartier, an outrageous wannabe disco diva who witnesses a murder and is forced to hide in the one place nobody will ever think to look - a convent. Tickets for the production are on sale now by calling Melton Theatre box office on (01664) 851111.